Our first full day in Montreal began very early as we decided to hit up the Jean Talon Market for breakfast. 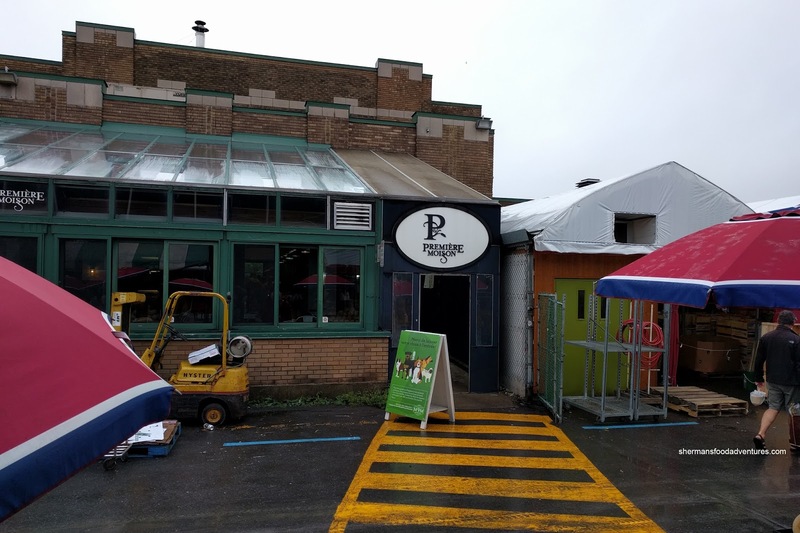 When we arrived, vendors were setting up their booths full of various goodies including a bevy of fresh fruit and vegetables. However, we were looking for something more substantial, so we walked all the way to the back where Première Moisson was located. Viv tried her best to order in French and it turned out quite good, but she had a hard time keeping up with the reply from the staff. In the end, we got what we needed as we were famished. We decided to give the basics a try first with the Butter Croissant and the Cheese Croissant. Flaky and shattering beautifully on the outside, the croissant was definitely buttery and delicious. Inside, the buttery goodness continued where it was moist and slightly chewy. A solid croissant to start the day. 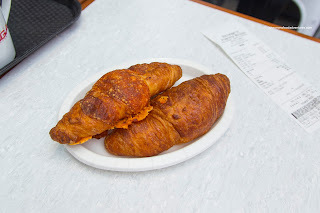 As for the cheese croissant, the texture was different on the inside as expected In addition to the chewy cheddar, there was more of a crunch near where the cheese oozed out of the croissant. It was also more aromatic and salty due to it as well. The double-baked Almond Croissant was softer thanks to the buttery almond filling. 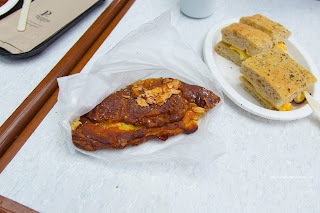 On the outside, it was crispy and had some laminating, but overall less crisp than the butter croissant. As mentioned, the filling was buttery, while aromatic and appealingly sweet. It was really heavy though and it was hard to finish. 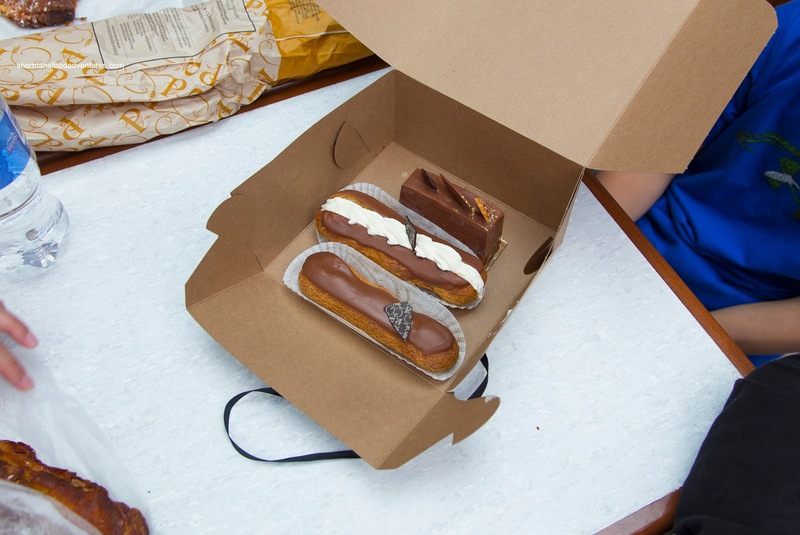 Costanza didn't care it was 8:00am in the morning and continued with the sweets with the Eclair (both regular and chocolate). We enjoyed the fresh creamy and light filling which was purposefully sweet while the choux pastry was also light, a bit crispy on the outside and completely moist and soft on the inside. 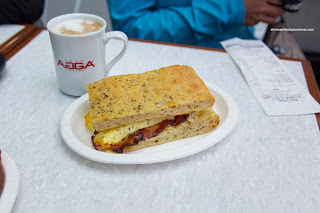 Viv and I shared a Croque du Jour which was focaccia with egg, bacon and cheese. This was simple yet tasty at the same time. The sea salt on top of the soft focaccia added bursts of flavour and crunch while the egg was fluffy and the bacon was thick and meaty. In the end, the stuff we tried at Première Moisson was pretty good and reasonably-priced. Not bad for a chain of stores. Service was definitely hurried though, but they were very busy.